Like all GFB lightweight pulleys, this one begins life as a single 6061 aluminium alloy billet, and is then precision CNC machined to exacting tolerances. 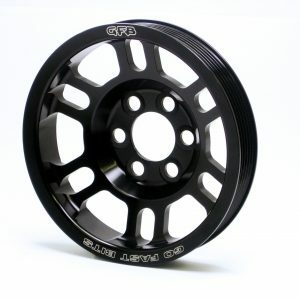 We then anodize it black for a stealthy appearance and superior wear resistance. This results in a large saving of 1.4kg of rotating mass over the factory pulley, without sacrificing strength or reliability.